Building muscular arms begins with focusing on exercises and routines that develop the smaller, weaker muscles first. These muscles are too often ignored, and when they are weak, they limit the ability to add size to the larger muscles like the biceps and triceps. Once you gain strength in these smaller muscles, you’ll be freed up to really add muscle and size to your arms. This guaranteed growth depends on two things: consistency and rest. 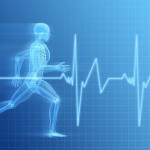 To build muscular arms, the first step will be to endure a consistent workload. You have to commit to doing the exercises. Rest is equally important, and for that reason you can train your arms two to three times a week, at most, and still reap excellent benefits. You should rest at least two days between sessions. This gives your muscles the necessary time to recover and rebuild, so that in each workout you are able to push your arms to fatigue and get the most out of your efforts. In the first weekly workout, as mentioned earlier, you are going to focus on the smaller, weaker muscles, like those of the rotator cuff. Take a 1-3 pound weight (yes… it’s light, but yes… it will burn) and perform a front shoulder raise, also known as a flexion movement, in which your arms begin at your sides and you raise them straight out in front of you, stopping at shoulder height. Your thumbs should be pointing up in this movement. Perform 8-10 reps, before moving onto the Y-dumbbell raise, or scaption movement, in which your arms will raise from your sides at a 45-degree angle, again stopping at shoulder height with thumbs pointing up. Perform 8-10 reps, then move into the T-dumbbell raise, or abduction movement. The arms raise from the sides straight out to the side of your body. Thumbs can either point up or palms can be pointing down. Remember to stop at shoulder height. Rest for a minute after doing all three exercises in succession, then repeat. Do a total of 3 sets. 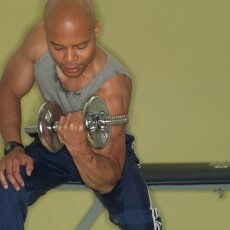 The last exercise specifically for the rotator cuff muscles is the L-dumbbell curl. Laying facedown on an incline bench or standing, let your arms hang straight down, palms facing behind you. Row the weights to the sides of your chest then rotate your forearms up and back as far as you can. Use a 1-3 pound weight. Do 8-10 reps.
Another day-one workout for the arms is the offset dumbbell lunge. Hold a dumbbell in your right hand next to your right shoulder. Lunge forward with your right leg and return to the starting position. Do 8 reps on each side. Rest 1 minute; do 3 sets total. Pushups are also tremendous for your arms. For extra work, do them with dumbbells in your hands (on the floor). 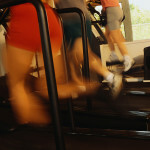 Find your maximum number in which you are completely fatigued and able to still use good form. From there, subtract 6. This is your target rep-range. For instance, if your max is 20, subtract 6 and do 14 pushups, rest, do 10 pushups, rest, and do 8 pushups. Do three sets of these from a regular width, a narrow width, and a wide width. For added intensity, assume a pushup position and grip a pair of dumbbells. Lower your body to the floor. As you push back up, rotate your body to the right and raise a dumbbell straight above your shoulder. For each rep, alternate your rotation direction. Do 3 sets of 8 reps per side, resting 1 minute after each set. The final day-one arm exercise is the farmer’s walk. 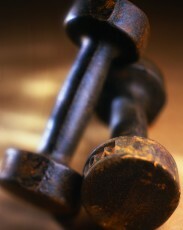 Hold heavy dumbbells in your arms and walk for 30 seconds to a minute and a half. Once you can walk longer than a minute and a half, up the weight. Your arms will feel fatigued as your tiny stabilizer muscles hold the weights. Your day-two exercises are going to focus on adding bulk and muscle to your arms. Start with close-grip chin-ups. Hang from a bar using an underhand grip, and keep your hands 6 to 8 inches apart. Perform a chin-up. Do 1 set each of 8 reps, 6 reps, and 4 reps, and then a last set of as many as you can. Rest 2 minutes after each set. Next, add some dips. Grasp the bars of a dip station and lift yourself so your arms are straight. Lower your body until your upper arms dip just below your elbows. Do 1 set each of 8 reps, 6 reps, and 4 reps, and one last set of as many as you can. Rest 2 minutes after each set. Dumbbell rows, triceps extensions, and bicep curls will also add mass to your arms. For rows, assume an athletic position, bend the knees, and bend about 45-degrees at the waist. Let your arms hang and pull the weight up toward your shoulders, keeping a 90-degree angle in your elbows. Do 3 sets of 10 reps, resting for a minute between sets. For triceps extensions, lie faceup on a decline bench and hold dumbbells over your head with your arms straight. Lower the dumbbells until your forearms are beyond parallel to the floor. Do 2 sets of 6 to 8 reps, and then one set of 15 reps. Rest 30 seconds after each set. For dumbbell curls, try them in three different positions: inclined, seated, and declined. Do 6 to 8 reps each of the curl while lying faceup on an incline bench, while seated on a flat bench, and while lying facedown on an incline bench. That’s one set; do 2. Rest 30 seconds after each set. Remember to allow enough rest between workout sessions. Stick to these workouts on a consistent basis, and your arms will grow like never before.